Use Yahoo / Google Groups as free mailing lists for Blogger | NewbieTechTips! If you are looking for a free alternative of email mailing list for your blogger blog then Yahoo Groups or Google groups come to your aid. It is not the usual email Newsletter like Mailchimp etc. but it works well if your requirement is just a means of providing a way to give your readers option to read your posts via email. I prefer Feedburner for email subscription for my blog, but as I wrote about how Google may shut down feedburner some day, that's why this article. It's easy to set up the Groups as email newsletter. I explain here with Yahoo Groups as an example, Google groups is almost similar. 2. Click on create a group and enter the details like group email and group name etc. 4. Now go to Manage Members (http://groups.yahoo.com/neo/groups/group-name/members/all) and add the email associated with your blogger blog and make that member as moderators and set the posts as unmoderated. 5. Now Go to your blogger blog dashboard --> Settings --> Mobile & Email and enter your yahoo group email id to the column 'Email Post To'. This will ensure that whenever you create a new post it will be sent to the group email address that is posted to the Group. That's all… You have successfully set up the blog mailing list. Now for readers with yahoo email id, give the URL of the Group to your readers and ask them to click of 'JOIN GROUP' button on your group's home page. For members with other email id just ask to send a email to address 'groupname-subscribe@yahoogroups.com' to join the mailing list. 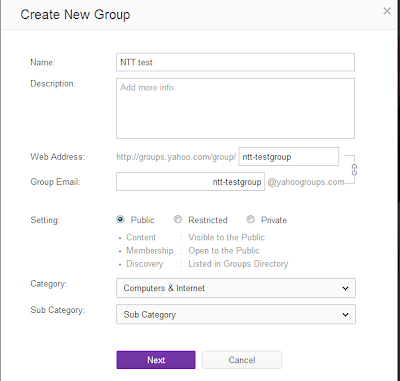 Unfortunately the email subscribe box which was available in old yahoo groups has been removed from the new groups, so now it is not possible to place a email subscribe box to your blog. Now for Google Groups, you have to follow the similar steps as above. In Google there is a predefined option to set the group as mailing list, you can choose that option. With using Groups, you can post occasional announcements to your subscribers, and you can also send them some posts which you do not want to post on your blog. You can attach files along with the posts. The downside of this method is that the whole post is send to the group and you cannot send a summary of the post so that the subscribers have to visit your blog to read the post. So if you monetize your blog with ads, you probably do not want to use this method.